On Monday, October 31, 2011, a car drove into the back of my Suzuki SV650S as I was pulling onto a roundabout. I suffered severe soft tissue injuries to my right shoulder, right calf and left forearm and my bike sustained considerable damage so I immediately contacted my insurance company. However, although the accident clearly wasn’t my fault, they told me I couldn’t make a claim as I only had insurance cover for 3rd party, fire and theft! I’d never been involved in anything like this before so, when a friend suggested I contact Motorcycle Law Scotland and talk to Brenda Mitchell, who was looking after his motorcycle accident insurance claim, I took his advice. Straight away, Brenda started sorting things out. Within days of the accident, Brenda had submitted motorcycle accident and personal injury claims on my behalf and arranged for a replacement hire bike to be delivered to me. Brenda didn’t pull any punches about how long it would take for my claims to be resolved or how much compensation I might receive, which suited me perfectly. All I wanted was a fair, realistic settlement for my injuries, the damage to my bike and my bike gear. Within two months, Brenda came back to me with a decent offer from the other party’s insurance company for the motorcycle accident claim, which I accepted. Brenda warned me it would take longer to resolve my personal injury claim as my injuries, which had led to six weeks off work, would have to settle down before I could undergo a medical examination. As my case progressed, I had complete confidence in Brenda and the Motorcycle Law Scotland team, who kept me fully up-to-date with developments. A few months ago, my personal injury claim was settled and I was very happy with the compensation I received. 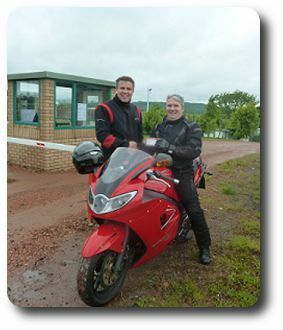 All in all, the service I received from Brenda and Motorcycle Law Scotland couldn’t have been better. I liked how efficiently Brenda dealt with every aspect of my case and I also liked her realistic, honest approach. Brenda covered all the bases, ensured I was fully informed, always found time to talk to me, understood about motorcycling and fought my corner. Quite simply, what more can you ask for?